Rachel, where do we even start…. Rachel with the gorgeous red hair and strikingly bright blue eyes! 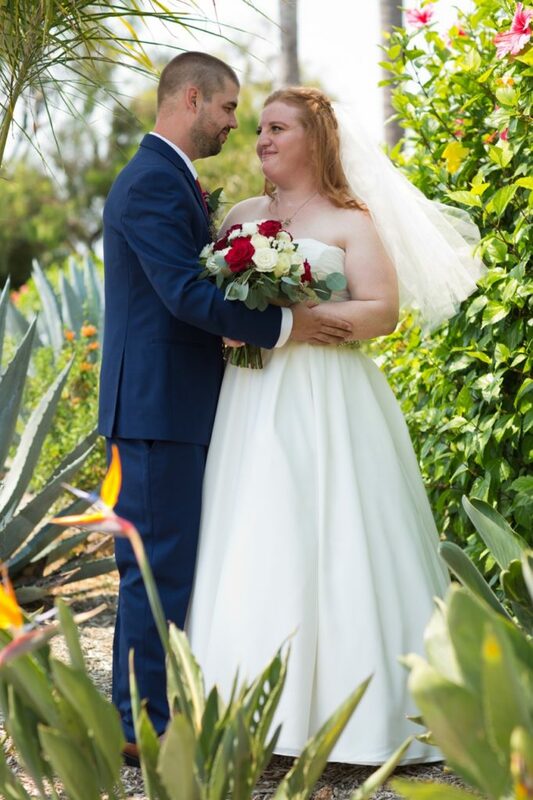 She got married in August with the awesome date of 8/18/18, and the sun was sure shining for them that day! The wedding dress she chose and fell in love with was an absolute dream; a strapless ruched bodice and ivory chiffon ballgown wedding dress. In alterations, she added one of our super blingy belts with a tulle backing. 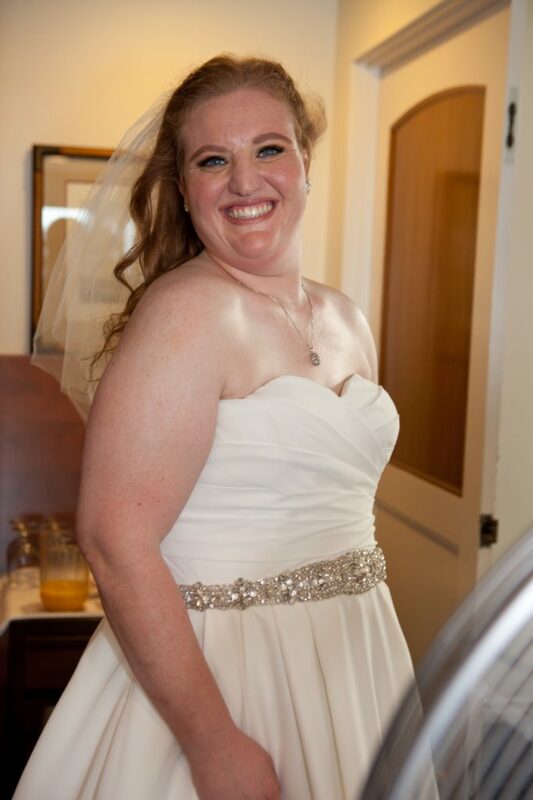 She added the perfect amount of sparkle to compliment her ivory chiffon ballgown wedding dress. The pictures from their big day are just spectacular. We are awed by the beautiful greenery and birds of paradise surrounding them. Her husband’s tie even matched the roses in her bouquet. After the wedding Rachel’s dad brought in her gown for preservation and treated us to a sneak peek of her photos. We found out that during the wedding, they did a super fun flash mob style dance. We can’t even imagine how fun that must’ve been for everyone, having the whole family together, laughing, dancing, and crying! Her parents, Dennis and Maxine, celebrated their 38-year anniversary the day before the wedding. Happy 38 years to some strong and loving parents! 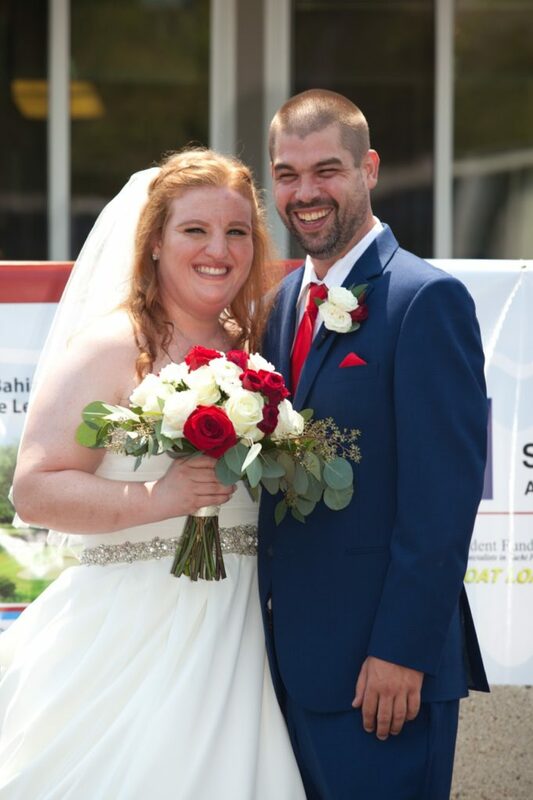 When we got a chance to hear how the experience was, Rachel said, “The wedding was the best day ever! My dress was a hit, so gorgeous, and made me feel soo beautiful!” Awwwhhh, how wonderful is that. Getting to work closely with Rachel and help her dream turn into a reality was extremely exciting for all of us. We are so cheerful for this couple’s union, and support them every step of the way! Congratulations Rachel, don’t ever stop flash mob dancing!! Even though you’re living in the Pacific Northwest, you’ll always be a Strut Bride! If you love Rachel’s chiffon ballgown wedding dress, it HAS POCKETS!!!!!!!! Find this amazing wedding dress with pockets in our Orange County area bridal store and our Phoenix area bridal store. It’s available to size 28 in white or ivory, and we love to accessorize this bridal gown. Book your appointment today!